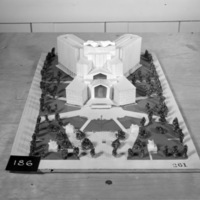 Architectural model, Competition entry 261, City Hall and Square Competition, Toronto, 1958, by C. C. Wilkie of Morrisburg, Ontario, Canada. 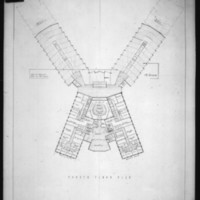 Architectural drawing, Competition entry 261, City Hall and Square Competition, Toronto, 1958, by C. C. Wilkie of Morrisburg, Ontario, Canada. 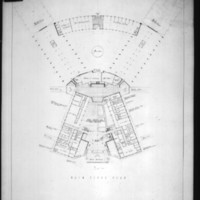 Main floor plan showing library, fountain, city and metro offices, band rostrum and future extension areas. 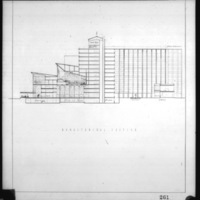 Architectural drawing, Competition entry 261, City Hall and Square Competition, Toronto, 1958, by C. C. Wilkie of Morrisburg, Ontario, Canada. 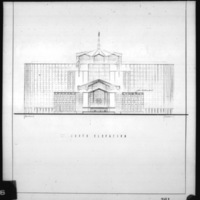 South elevation drawing showing open sculpture panels and future extension areas.